It came into use again when I joined a team that had been ground down on a project. Working out what I could do best as the Tech Lead, it helped me look for the subtle differences between two of the team member’s woes. Both frustrated, but one bored, the other fatigued. Once acknowledged I could then put different, personalised actions into place. We all perform at work. You might think it’s a term that is more likely to be used at an athletics stadium, but it applies just as well to the office. We all are expected to play certain roles and to be good at certain things. If you are good at something and become the go-to-person who can predictably deliver, that’s performing consistently. Performance isn't just knowing a skill or a set of heuristics. To perform optimally there's a lot of head games to consider, but for now I want to focus on one aspect. 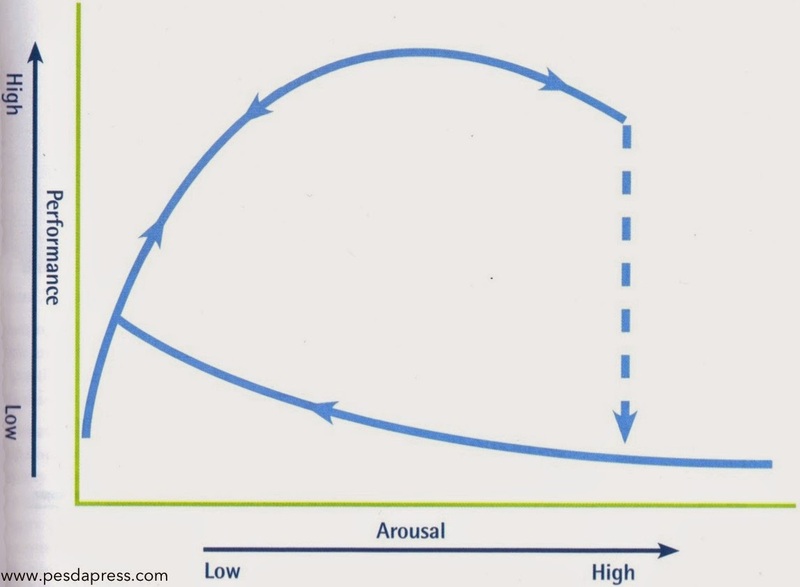 I discovered the similar concept of 'Arousal and Performance' and the 'Catastrophe Curve' in my sports coach studies. Sports science research found that there was a strong relationship between performance and arousal, with an optimum space for performing. 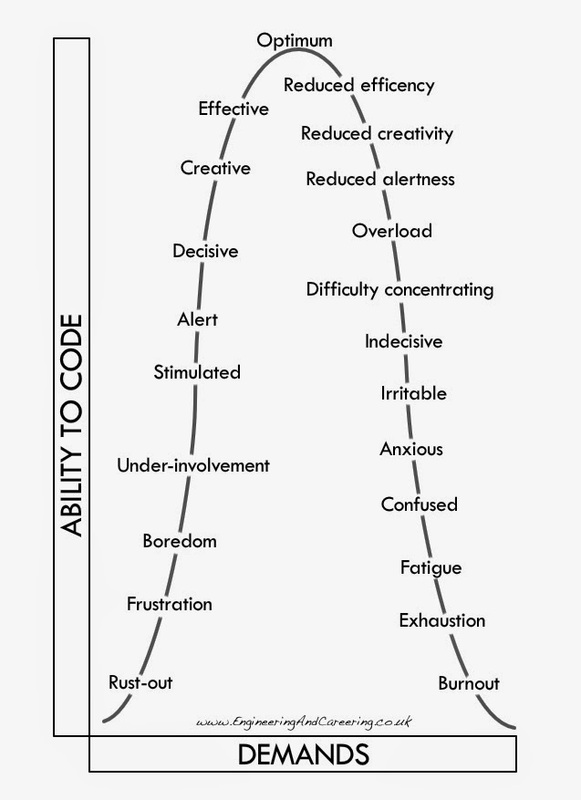 Just like the 'Ability to Code' model, after a certain point there was a drop-off of performance caused by over stimulation. In sports the drop off can be sudden and severe. There are a few theories around this collapse. It might be due to the self confidence hit: the awareness that they are failing to perform well, or a mix of physical and mental exhaustion from an increasingly demanding task. As physical anxiousness starts to dominate a vicious cycle of awareness and anxiousness begins. There's a lot going on but generally it's accepted that there is a collapse and when it happens, its not easy to recover. The most important learning for me was the observation that when a performer hits the burn-out phase – the Catastrophe - they can’t tippy-toe back to the zone of optimum performance. They need to take the long walk back to the pavilion and spend some time in low arousal states before being able to get their game back. When confronted with team member with burn-out, I try to find them some work that is valuable but not so stimulating, to give them a chance to wind down and review where they are at. Of course these curves vary for everyone, and for the same person in different situations and different tasks. There is a model that highlights a little of how different situations and attitudes can shape different outcomes and give us some more awareness of the personal nature of this. There are different tones available to stimulation and pressure. Unpleasant tones can lead to anxiety and pleasant tones to excitement. A person’s physical and mental state can mean that the same situation can cause feelings of excitement or of danger. Perception can play a big part in how someone sees stimuli. A workplace that feels safe and a team that supports each other can lead people to see things in the best possible light. Everyone has roles and tasks that are easy and safe, and work that is challenging and adventurous. We often talk of someone stepping outside their comfort zone. 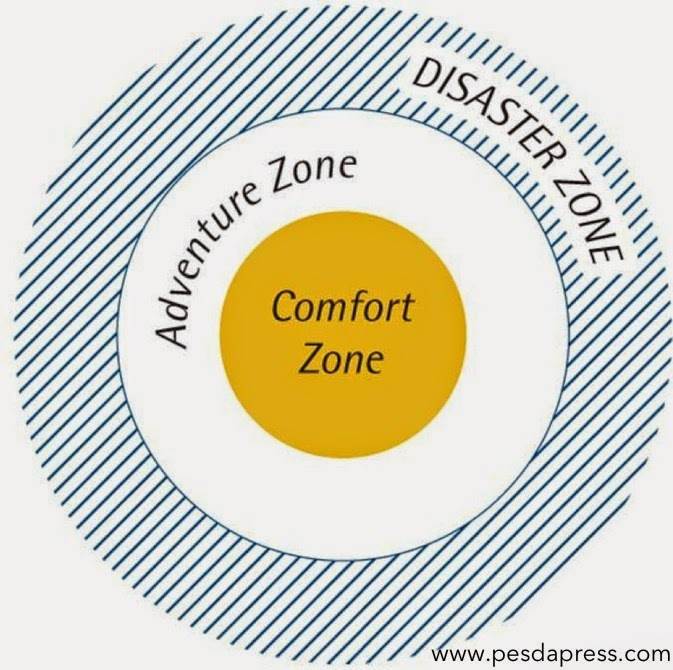 The spaces outside the Comfort Zone can be seen as the Adventure Zone and the Disaster Zone. It's in the Adventure Zone that we do our best exploring and discovery, whilst still being consistent and in control. It's likely that with the excitement we are more focused and engaged than usual. When working in the disaster zone, we may hit dizzy new heights, but we can also become unpredictable. We need to move ourself and our teams into the adventure zone when we can, and lead them carefully to ensure that they remain feeling safe, and we avoid crashing into catastrophe. Once you understand and have helped manage your team's ability to perform, you can start to deligate and build a self-reliant team.